August 3, 2016 By This post may contain affiliate links. 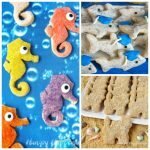 If you want a quick and easy way to decorate a batch of cut-out Seahorse, Shark, and Sand Castle Cookies for your beach party, you can sprinkle on colorful sugar, dip them in cookies ‘n cream candy, or top them with peanut butter candy melts and cookie crumbs. Beach party, you ask? But, school is starting. Summer is not over, no matter what the school calendar says. It’s just too soon for the days to be getting shorter and the pools to be closing for the season. I’m certainly anxious for cooler temperatures, but I am not ready to see the sun go down earlier. I love those extra hours of daylight. I feel energized and can accomplish so much more than I do during the grey days of winter. You’d think with all that extra energy I’d have gotten all these beach treats posted by now. I really wanted to share the recipes so you’d have plenty of time to make them for your summer parties. You still officially have over 7 weeks of summer left to enjoy. 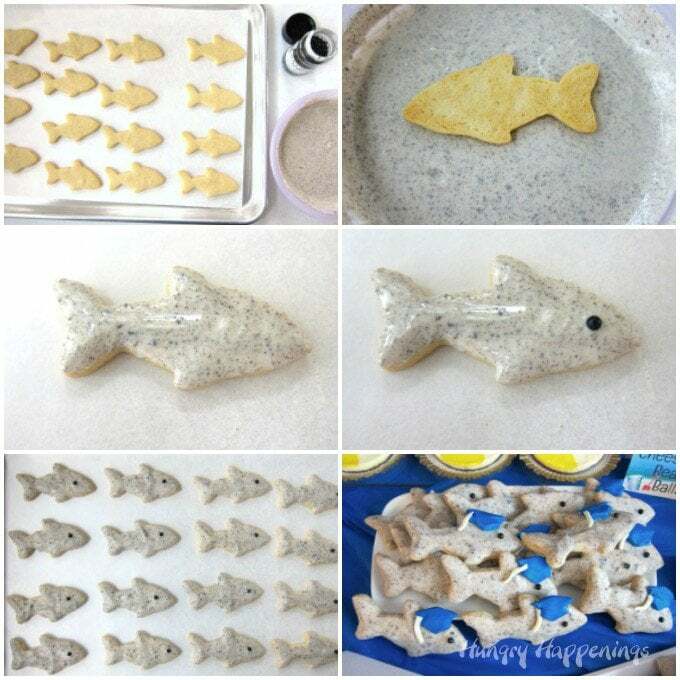 So, grab some cookie cutters and have a splash of fun decorating these cute summertime treats. Last week I shared a trick to decorating cut-out cookies using modeling chocolate. The Palm Tree Cookies I created were really cool, but admittedly a bit time consuming. So, today, I’m going to share 3 simple ways to decorate your cut-out cookies that can be done really quickly. The finished cookies look really cool too, but they wont take you all day to decorate. Each technique can be used to decorate cut-out cookies in any shape or size. You can find the cookie recipe at the end of the post and a guide as to how many of each shaped cookie you’ll get out of one batch of dough. These brightly colored Sugar Coated Seahorse Cookies are crunchy and sweet. Each is simply decorated using colored sugar and a candy eye. One recipe of cookie dough makes about 20 ounces. If you use a 3 inch seahorse cookie cutter, you’ll need about .4 ounces per cookie, so you’ll get about 4 dozen cookies per batch of dough. You’ll need about .1 ounce of colored sugar per cookie for a total of 4.8 ounces. Decorate by adding one candy eye, attached to the cookie using piping gel, candy melts, or frosting. To make these seahorse cookies, use a seahorse cookie cutter to cut your dough. Pop the cut-out cookie dough in the freezer for 10-15 minutes so the cookies are easier to move. 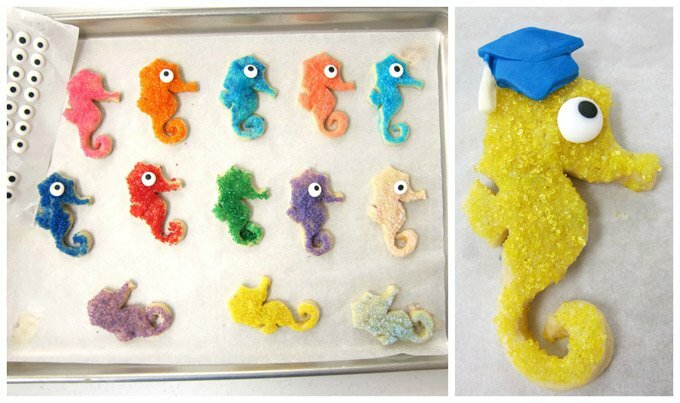 Brush a seahorse with egg wash and immediately sprinkle colored sugar over entire cookie. Use as many colors of sugar as you’d like. Move the cookies to a baking pan that is lined with either a clean silicone mat or a piece of parchment paper. Bake at 350 degrees for 6-10 minutes until the edges just begin to lightly brown. Remove and allow to cool completely. Use piping gel, candy melts, or frosting to attach a candy eye to each seahorse. I served these seahorse cookies at a graduation party, so I added a candy clay grad cap to some of them. I used a small silicone mold to create the caps. Crush chocolate cookies into fine crumbs then mix them with melted white confectionery coating (candy melts) to make a grey candy with tiny dark specks to use to top shark shaped cut out cookies. If you use a 3 inch shark cookie cutter, you’ll need about .3 ounces per cookie, so you’ll get about 65 cookies per batch of dough. You’ll need about .1 ounce of cookies ‘n cream candy coating per cookie for a total of 6.5 ounces, but you’ll need more in order to easily dip the last few cookies. So melt 8 ounces of white candy melts and stir in 1/3 cup cookie crumbs. Decorate with one black candy pearl eye. Cut out the cookie dough using a shark cookie cutter then bake the cookies for 6-10 minutes at 350 degrees F. Allow the cookies to cool completely. Melt white confectionery coating and stir in chocolate cookie crumbs. Dip the top of each cookie into the cookies ‘n cream candy. Remove and shake off the excess candy. Immediately, while the candy coating is wet, press one black candy pearl onto cookie creating the shark’s eye. Refrigerate until candy coating hardens, about 5 minutes. Once again, I added some candy clay graduation caps to some of the sharks. To make these cookies look like they are made of sand, you’ll want to top them with peanut butter flavored candy melts and some cookie crumbs. If you use a 3 inch sand castle cutter, you’ll need about .8 ounces per cookie, so you’ll get about 25 cookies per batch of dough. You’ll need about .3 ounce of peanut butter flavored candy coating per cookie for a total of 7.5 ounces, but you’ll need more in order to easily dip the last few cookies, so melt 10 ounces. You can either use 10 ounces peanut butter candy melts or you can stir 2 tablespoons of peanut butter into 8 ounces of white candy melts. Decorate each cookie with about a teaspoon of cookie crumbs, so you’ll need about 1/2 cup of crumbs. I used butter cookies, but you could use peanut butter cookies or vanilla wafers too. Cut out your cookie dough using a sand castle cutter then bake them for 8-12 minutes at 350 degrees F. Allow to cool. Dip the top of each cookie in melted peanut butter flavored candy melts then immediately sprinkle with cookie crumbs. To make these cookies, you’ll need some supplies which you can find at Amazon.com (I make a commission from each sale, but you wont be charged any more. Thanks!) I couldn’t find the exact same seahorse cutter or graduation cap mold, but the one below is pretty close in size and shape to the ones I used. The perfect cut-out cookie dough that will hold it's shape and taste great. 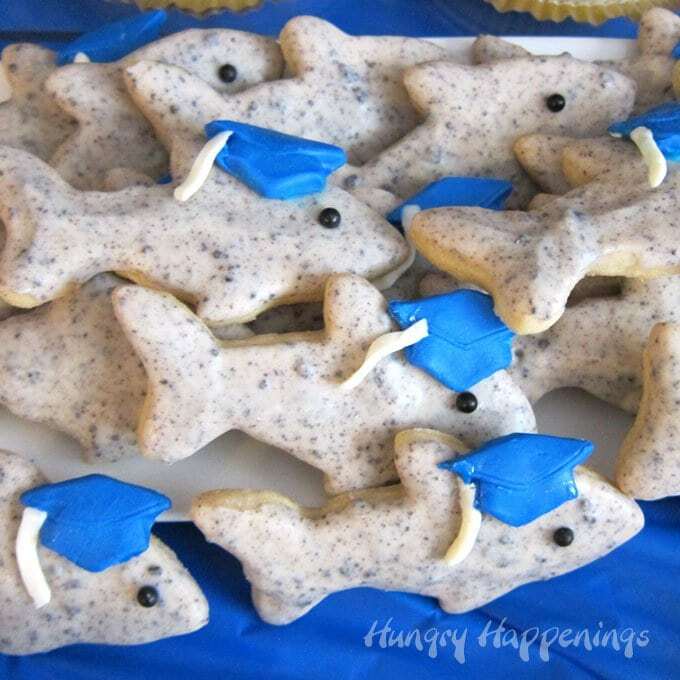 These cookies are great for graduation parties, pool parties, or any party you can think of! 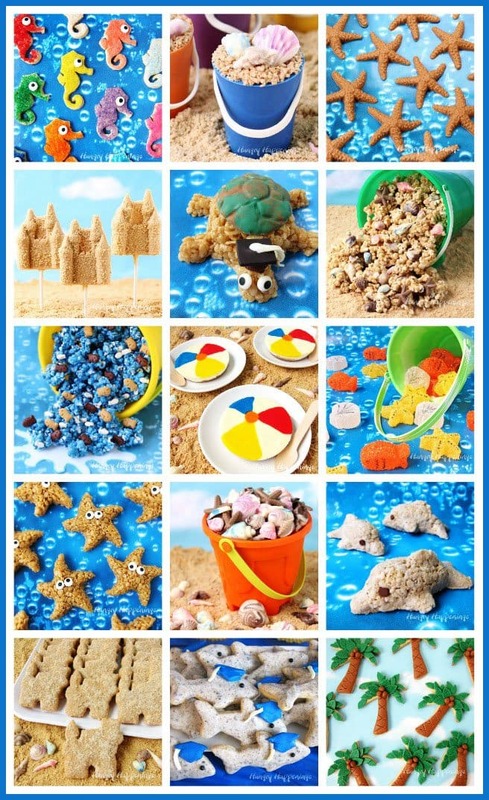 Create seahorses, sharks, sandcastles, and much more. Stir in vanilla, and almond extract then stir in the egg until well incorporated. Add dry ingredients and stir just until combined. If the dough is sticky, add a small amount of flour. 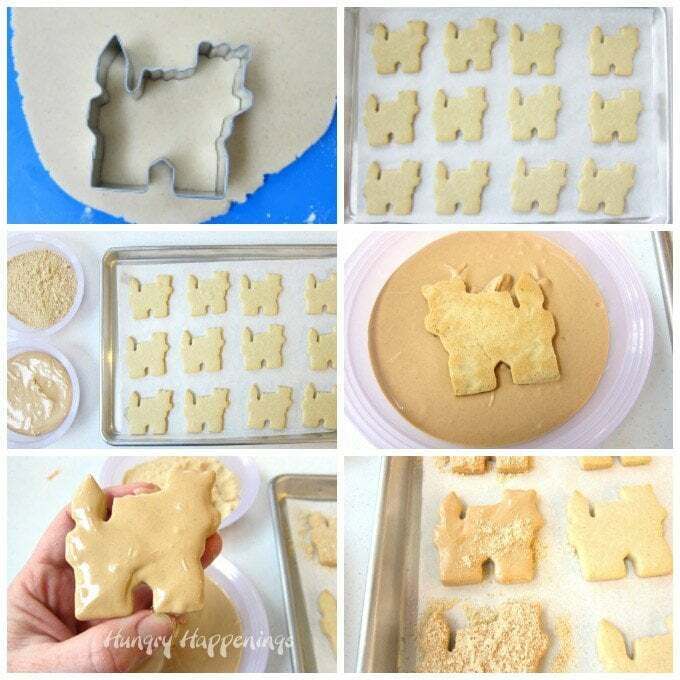 Cut dough using cookie cutters. Bake cookies for 6-12 minutes, depending on the size, until the edges are set and the tops look dry. Cool cookies completely then decorate using one of the methods in the tutorial. 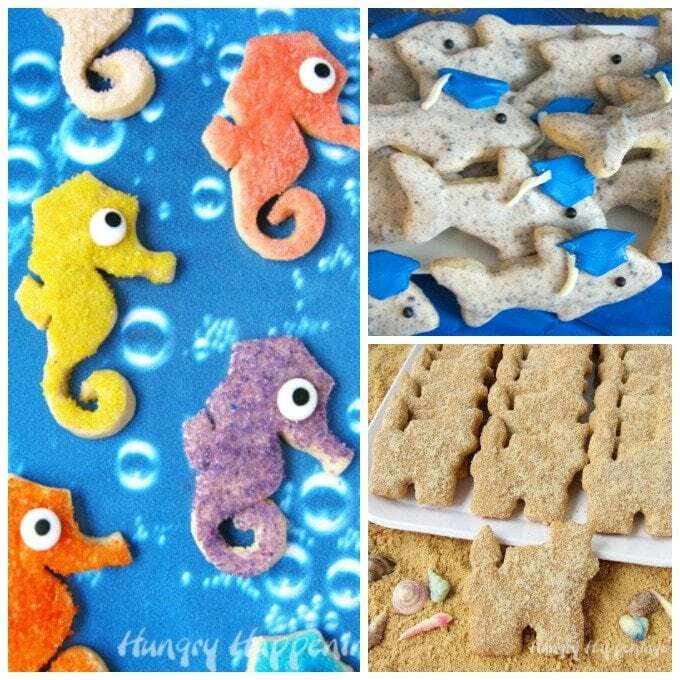 If you recreate these Seahorse, Shark, or Sandcastle Cookies be sure to link to this post and/or tag @HungryHappenings on Instagram and send me a picture so I can share it in my Readers’ Gallery. 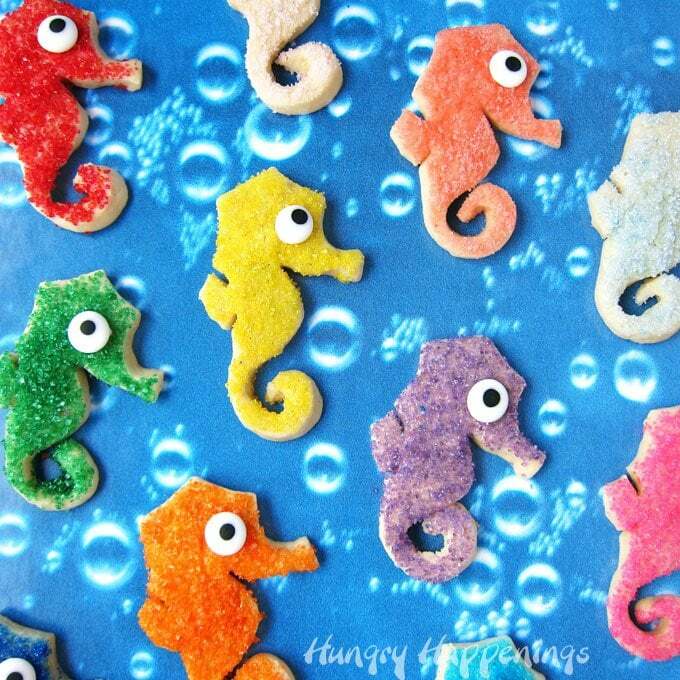 The cookies are just all so cute, the sanding sugar really dresses them up, I really love the bright seahorses! Thanks! I loved the bright colors too. Yes! Summer is a looong way from over! That leaves us plenty of time to make some of your yummy looking goodies. Those seahorse cookies are so cute but I have a soft spot for anything peanut butter. 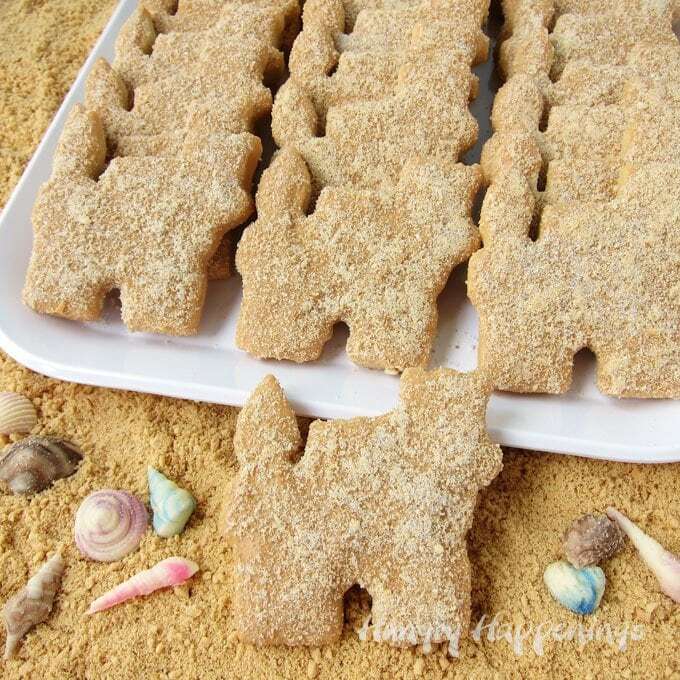 What an awesome way to decorate your sand castle cookies. Happy Summer Beth! Happy summer to you too, Karen. I love peanut butter too and loved those cookies. The heat wave we are having sure reminds me that summer is definitely not over!